This huge elliptical galaxy NGC 5128 (also known as Centaurus A) is the closest such galaxy to the Earth, at a distance of about 12 million light-years. Observations with ESO’s Very Large Telescope in Chile have discovered a new class of “dark” globular star clusters around this galaxy. These are marked in red. Normal globulars are marked in blue and globulars showing similar properties to dwarf galaxies are in green. The dark globulars appear very similar to other globulars around this galaxy but contain much more mass. 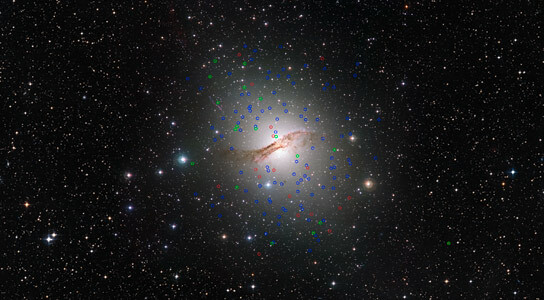 Using data from ESO’s Very Large Telescope, astronomers have discovered a new class of “dark” globular star clusters around Centaurus A. These star clusters contain much more mass and may either harbor unexpected amounts of dark matter, or contain massive black holes. The elliptical galaxy Centaurus A (also known as NGC 5128) is the closest giant galaxy to the Milky Way and is suspected to harbor as many as 2000 globular clusters. Many of these globulars are brighter and more massive than the 150 or so orbiting the Milky Way. 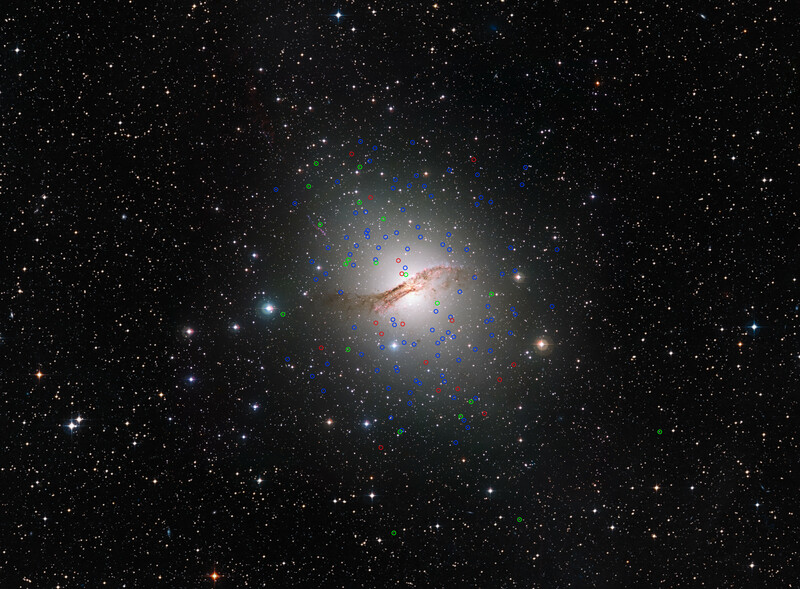 Matt Taylor and his team have now made the most detailed studies so far of a sample of 125 globular star clusters around Centaurus A using the FLAMES instrument on ESO’s Very Large Telescope at the Paranal Observatory in northern Chile . They used these observations to deduce the mass of the clusters  and compare this result with how brightly each of the clusters shines. This close-up video sequence shows the huge elliptical galaxy NGC 5128 (also known as Centaurus A). This object is the closest such galaxy to the Earth, at a distance of about 12 million light-years. Observations with ESO’s Very Large Telescope in Chile have discovered a new class of “dark” globular star clusters around this galaxy. These are marked in red. They appear very similar to other globulars around this galaxy but contain much more mass. The FLAMES observations provide information about the motions of the stars in the clusters. This orbital information depends on the strength of the gravitational field and can hence be used to deduce the mass of the cluster — astronomers call such estimates dynamical masses. The light gathering power of a 8.2-metre VLT Unit Telescope mirror and FLAMES’s ability to observe more than 100 clusters simultaneously was the key to collecting the data necessary for the study. Be the first to comment on "Evidence of a New Type of Star Cluster"